Here’s an interview Pete did for Mayfest about the making of My Son & Heir. 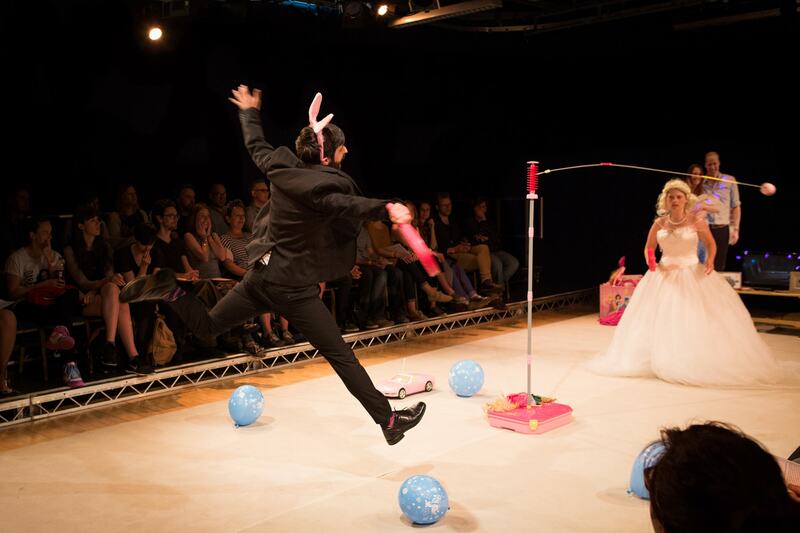 Search Party is back with their brand new piece My Son & Heir, an anarchic celebration of the everyday heroism of parenthood, set among a never-ending mess of plastic, flashing-beeping, bubble-blowing chaos. I caught up with Pete Phillips, one half of the company, and asked him about parenthood, the royals, and growing old together. What led to you make My Son & Heir? Jodie was in the final stages of pregnancy with our second child, a boy, when the announcement of a royal bun-in-the-oven was made. Our son and Prince George were born within a year of each other. This comparison is interesting for us, not because we aspire to royalty, far from it, but because we’re currently witnessing a distinct shift in the narrative surrounding the royal family. We feel that there are clear and perhaps quite cynical attempts being made by the royal family and some areas of the British media to normalise the ‘new’ royals, trying to make them appear just like us. As new parents living in an age of austerity, we find the comparison insulting, and a way of diverting attention away from the ludicrousness of inherited privilege. The piece, for us, is a way of saying, “No, you’re nothing like us.” The world we are raising our son into is very different to the one Prince George will inhabit. And that uncertainty of what our son will become, and to what extent we are responsible for his happiness, safety, and prosperity is explored in the piece. It’s about raising boys, and the problems of boys becoming men, and what that means for us as parents. How does it fit into Search Party’s greater body of work? Is it a departure? A development? A tangent? My Son & Heir is a part of our Growing Old With You series. Growing Old With You is a life-long performance project that explores how our perspectives of ageing change, as we grow old together. The project acknowledges our artist-duo-couple dynamic as a starting point and commits us to making a series of performances, the first of which was in 2009, the year we both turned 30. My Son & Heir is framed by that larger project, acknowledging our now artist-duo-couple-parent dynamic as its point of departure. What will the piece feel like to a member of the audience? The piece is a bit like being in our house in the evening just before bedtime. It’s a kind of playful chaos, we’re at once joyful, and at the end of our tether. It really shifts in tone, and by the end, we start openly addressing issues and concerns that parents aren’t really even allowed to think about, let alone say out loud in public. It’s quite exposing in that way. You are well known in Bristol for Save Me, your semaphore soap opera across the city that showed in Mayfest 2011. How is this piece similar? How is it different? My Son & Heir is much closer in feel to our other studio pieces, which have been shown in Bristol as well. The semaphore piece Save Me again uses our relationship as a framing device, and it has a kind of tenderness that comes with the deliberately slow reflections on separateness, which exists in way in My Son & Heir, but now – since the birth of our second child – that tenderness is ruptured by the relentlessness of family life. I don’t really know how to answer this question … I think we want to help, in a really small way, to reframe the dialogue around parenting. Say some things out loud that are hard to say as parents, because we’re told to be in control, to be completely, undeniably, authentically in love with our offspring, to provide a ‘better’ life for them than we had ourselves. To step outside of that mantra is exposing. Before we had children we could conscientiously avoid aspirational mainstream culture, now it’s difficult to avoid, and that is quite frightening.